Believe in Santa Claus? 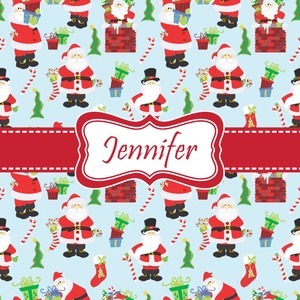 Whether you do or not, this design is absolutely adorable with the background that has a cheerful Santa Claus all decked in his red and white, climbing down a chimney to leave presents upon presents and endless candy canes under your Christmas tree. The ribbon and label are red, and the label is the perfect place to put your name or text for personalization.